Women's football in Chesterfield during World War One: The first-ever competition in England? Dulwich Hamlet is one of the oldest and best known names on the non-league circuit, having been founded as a Sports Club in 1893 by Lorraine ‘Pa’ Wilson at the request of local youngsters. The club once had thriving cricket, cycling and chess sections but the football club is best known for being a member of the Isthmian League since 1907, being winners on five occasions and winning the FA Amateur Cup four times, as well as achieving many other local honours. The club is no stranger to conflict and lost a staggering twenty-two members during the Great War and a further four during the Second World War of 1939-45. My friend and fellow Hamlet fan Roger Deason has written about the club’s Great War casualties and hopefully will contribute a future blog post about these men at some point but until recently, the four more recent casualties have been somewhat overlooked, even though two of them were relatively high-profile England Amateur Internationals. The first of our 1939-45 casualties was Eric Pierce, whose senior Dulwich Hamlet career would be over almost as soon as it started. Eric was born in Camberwell on 15 June 1921 and had played all of his football prior to the outbreak of war for the club’s Junior teams. The loss to service of many of the club’s more senior players saw Eric break through into the First Team for some of the local wartime league matches that replaced the usual Isthmian League fixtures but on 23 January 1941, Eric enlisted into the RAF to train as a pilot. He was undergoing training at 16 Elementary Flying Training School at RAF Burnaston and had passed a major milestone for any aspiring pilot by achieving solo flight. Unfortunately, on 12 October 1941 when undertaking aerobatic duties, his Miles Magister trainer aircraft suffered an engine failure whilst at low altitude and despite his attempts to make a forced landing, Eric’s aircraft crashed into a field at Broken Flats Farm in Derbyshire, which killed the young pilot instantly. The second to perish was 35-year-old Ron Ebsworth, who had joined the club in 1936 from Isthmian League rivals Ilford FC. 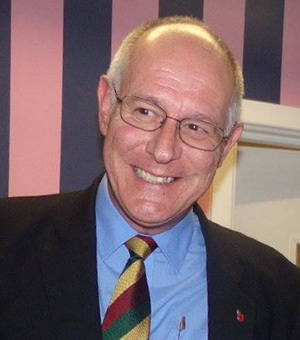 Whereas Eric was at the beginning of his playing career, Ron was coming towards the end of his and whilst he played a number of times for the Hamlet First Team, he played the majority of his football for the club’s Reserves and indeed was Vice Captain and then Captain of the Reserves by the outbreak of war. 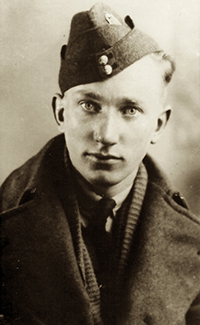 Like many of his team mates, Ron volunteered to serve as RAF aircrew and enlisted into the service on 13 July 1940. He trained and qualified as a Wireless Operator/Gunner and was posted to 214 Squadron, Bomber Command, which flew the Vickers Wellington bomber, at that time the main workhorse of the RAF’s bomber squadrons. Ron and his crewmates completed four operational flights but they were not to return from their fifth, a mission to Hamburg on 30 November 1941, during which their aircraft was lost without trace near the Dutch coast. Ron has no known grave and is today remembered on the RAF Memorial at Runnymede in Surrey. 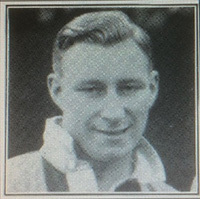 The third casualty was Reg Anderson, who like Eric Pierce had joined the club as a youngster and had progressed through the club’s Junior teams. Reg was a local boy, born in Peckham and who lived in Dulwich, quite close to the club’s Champion Hill ground. He was a natural footballer and had played for both his school and his Old Boys before joining the Hamlet in 1934 as an 18-year-old. He progressed quickly and broke into the First Team in late 1936 and was also part of the team that lifted the FA Amateur Cup in 1937 when they defeated Leyton 2-0 in front of 33,000 spectators at Upton Park. Reg’s form also attracted the attention of the selectors for the England Amateur side and he scored a hat trick on debut against Wales in an 8-2 victory at Rhyl in January 1938. As a result of this performance, Cardiff City signed him as an amateur at the end of this season but it was a brief dalliance – Reg’s heart remained at Dulwich and he returned to the club in time for the aborted 1939-40 season. He played in some wartime football for the Hamlet and continued to play representative football but volunteered to serve as RAF aircrew and enlisted on 22 July 1940. Reg trained and qualified as an Observer and was posted to Bomber Command, joining 106 Squadron. Reg was lost on his fifth operational flight, when his Hampden bomber was shot down over the Danish island of Sylt, with the loss of all four crew. 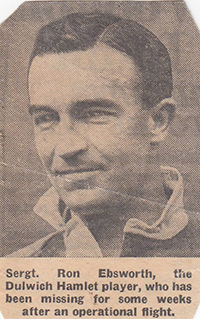 Finally, we lost 26-year-old Bill Parr, who unusually for the time was an established England Amateur International when he joined Dulwich Hamlet in early 1939, having already played seventeen matches for Blackpool in the old First Division of the Football League. 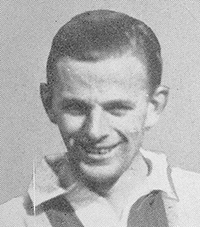 Bill had played alongside Reg Anderson during the latter player’s England Amateur debut and the two men had run riot down the right-hand side of the pitch, with Bill scoring four goals and Reg a hat trick, so he undoubtedly joined Dulwich in order to replicate this partnership with a player with whom he had formed an immediate rapport. The new club partnership bore immediate fruit when the Hamlet lifted the London Senior Cup but having played for Blackpool at the very highest level of English football, perhaps Bill found the Isthmian League a little too easy as Arsenal announced in May 1939 that he was to play the next season for them as an amateur. The 1939-40 season was abandoned and so there remains some doubt as to which club Bill would actually have played for, as some programmes for representative matches at this time still show him as a Dulwich Hamlet player. Like his three Hamlet team mates, Bill volunteered to serve as RAF aircrew and in his case trained as a Pilot. On completion of training, he was posted to Coastal Command to fly the Lockheed Hudson light bomber on Maritime Patrol duties covering the vital convoy routes on the Western Approaches. Bill was killed on 8 March 1942 when his aircraft suffered engine failure just after take-off on a night navigational training flight. The Roll of Honour from two World Wars is on display in the Dulwich Hamlet Boardroom at Champion Hill and today’s fans continue to honour these players from the club’s past who made the ultimate sacrifice. Steve is now a full time Battlefield Guide, blogger and researcher, specialising in the Home Front and London at war in particular and took the plunge into self-employment some two years ago. He has been a Dulwich Hamlet fan since 1990, originally fitting in games between watching his league side, Charlton Athletic but in recent years a season ticket holder at Champion Hill. He has recently written ‘For Freedom’ which tells the story of the club’s four Second World War casualties.